Louise! Please help! I have sent endless tech support messages to Instagram but, no response and, my problems with hashtags are getting really frustrating! I’ve read your insightful article, and I seem to be doing everything you are recommending. For a month now, and really really bad lately, I am having issues with my photos disappearing from hashtags. I am being extremely careful not to go past 30#. Double and triple checking to make sure none of the hashtags I am using are banned. My traction is suffering incredibly. And yes, though this is not a matter of life and death, I am highly discouraged. Any ideas?? So sorry this is happening. Unfortunately, it’s a fairly widespread problem, and Instagram is not fixing it. It’s been going on for many accounts since Sept 1, and I don’t know of a fix for it. 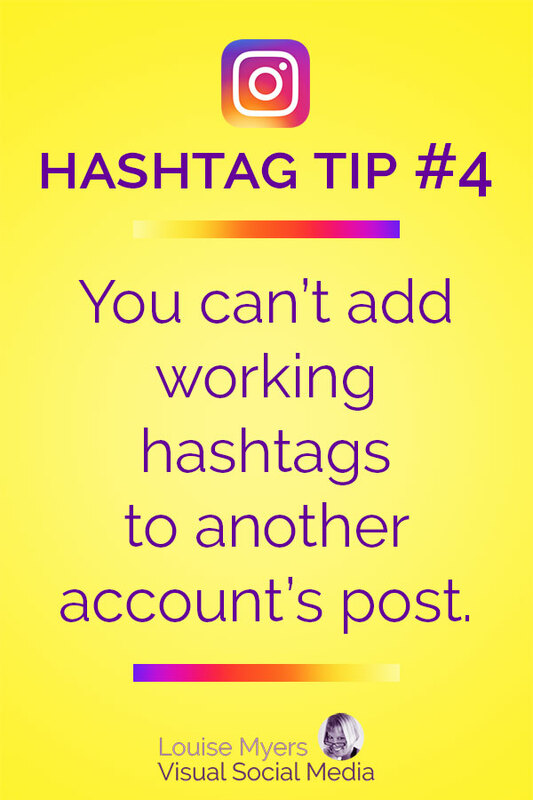 Wondering if you have had any luck getting your hashtag problem fixed? I am experiencing the same problem you describe for one of my Instagram accounts. I have the same problem 🙁 my photo shows up but only for a minute or so and then dissapears. I’m not using anz banned hashtags or more then 30… it’s so disturbing! Oh yeah, I totally agree with this article. But often hash-tags are almost useless. So, that is the reason why people usually use special services, zen promo as example. 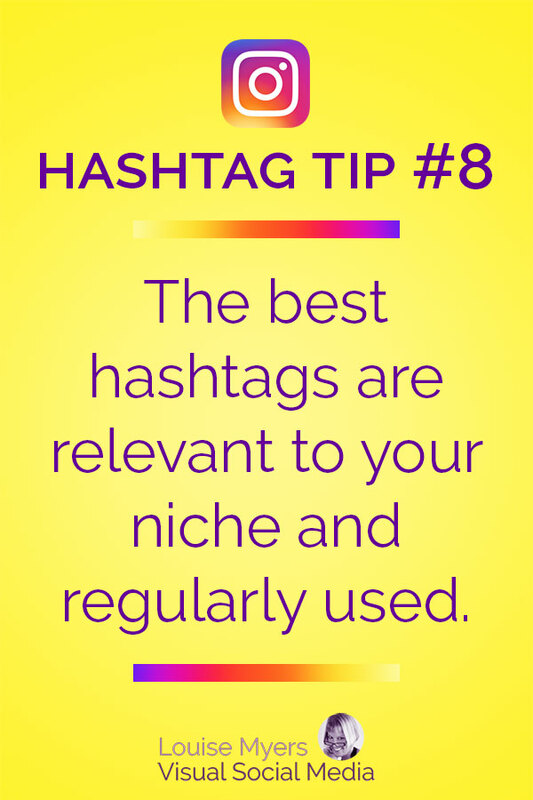 I couldn’t disagree more about hashtags. If someone is finding them useless, then they’re using the wrong ones. I would also strongly discourage anyone from using “special services” that are automated. This is against IG’s rules. I’m glad you found it useful, Stephen! I’ve noticed some people seem to be able to use 30 tags in both the caption and the comments (60 total). How is that possible? I’ve heard this works but never saw or tried it. Have you tried it, Dave? Well, I just tried it and it works. Considering using it going forward. Thanks for reminding me of this loophole. I heard of it ages ago and can’t believe they haven’t fixed it! Hi there, I loved this article. Thank you so much for posting it. I have a quick question. I just tried the . . . . . 30 hashtags in the post and then 30 more hashtags in the first comment and it did not work for me. Does this only work for some accounts and for some reason, not others? Also very quick second question, is it 30 hashtags total so that even if someone else hashtags in the comments, that hashtag does not work for your post, meaning, it does not show up in that hashtag list on Instagram. I only ask this because first, I always do exactly 30 hashtags, but I also have another account on Instagram and sometimes, I go and put a few extra hashtags in a comment from that other account when it’s a post I really want to get out there, thinking that will get the post on a few other hash tag lists, but I just noticed recently that although the comment stays, the post never actually shows up on those newer (now over 30) hashtags. So, is it 30 total, no matter who posts in comments, or maybe does IG know that other account belongs to me as well and so disregards. So perhaps organic hashtag comments from others (over 30) work? Or is it just 30 hashtags no matter what? Okay, so that questions wasn’t so quick, lol, but I wanted to give you all the details. Thank you so much for all your insight! Additionally, hashtags left in a comment by ANYONE other than the account itself DON’T add the post to the hashtag feed. If you’ve ever seen this happen, let me know. IG says it doesn’t. Hi all you do is post your photo and then put 30 hashtags in your comment. Then after this go back and add edit the photo and put 30 hashtags in the hashtag. So you can have 60 hashtags. Also about people think this would be too much and look spammy. I disagree that this many hashtags is negative. As long as you post awesome content and spacing out your posts and not posting all at once then most people don’t care. They just want to see great pictures in their niche. remember to first make awesome content, and don’t EVER buy followers or likes. 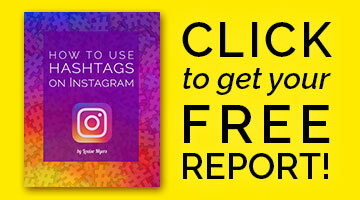 With the tools available, some effort and time anyone can make a great IG account. Yes, this works, as I mentioned above. I have found that my business account gets penalized for doing this, but not my personal account. So it’s definitely “use at your own risk.” While IG can’t seem to detect the extra hashtags (yet), they’re aware that immediately editing your caption is suspicious behavior. Hi, thanks for the insightful article. I am sure the gist of what is said is sound, and perhaps indeed the more hashtags, the greater the subsequent engagement levels. However, based solely on your extract of the study you cited (which could be taken out of context), it seems the authors of that study have no statistical background at any level. Those raw figures clearly suffer from noise and no elementary regression or hypothesis testing was performed. I wouldn’t base my argument on that study. That’s an interesting observation. All I can respond is, it works for me, so I’m gonna keep doing it. Others can do their own testing to see if it works for them. I’d highly recommend trying it. I have no “argument,” axe to grind, or thing to sell. I’m just providing loads of helpful advice. Try it! i want to ask you, a few months ago my account instagram get banned by IG until twice. before get banned, my follower increase appx 500-1000 follower / daily. And after recovered by IG, my follower drop (app a hundred daily) and sometimes increase only below 100 a day and tommorow dropped again. my question, how to recovered my follower growth like before banned? 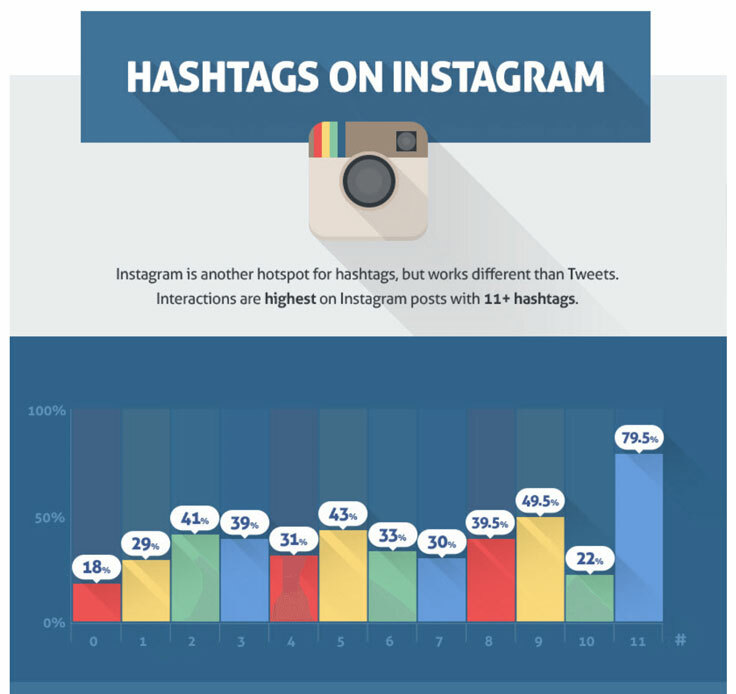 Is it important to use hastags? Because after banned, i use hastags and not useful. please the best answer of my problem. you can reply me in my cooment or in my email. My question for you would be, how were you gaining so many followers before being banned? It seems highly unlikely by any organic means. if you have an email, i can send you a picture of screenshoot about follower report before banned and after banned louise. or you can check about my IG @capcussss in socialblade louise. (but in socialblade report only seen after banned and before banned not seen again). Great post Louise! Thanks for keeping us up to date. P.S. That idea about hiding the hashtags was worth it’s weight in gold! Hi, just wondering if you can help at all? I’m newish to Insta so still getting to grips with it. I post 2-3 pics on a daily basis and normally use between 20-30 hashtags per post. On posting I immediately start getting likes and normally end up with around 60-70 likes for each pic. Sometimes I will post a pic and I get no likes whatsoever, even though I’ve used pretty much the same hashtags. Do insta treat this as spam and block your hashtags? Is it that I have an invalid hashtag that is blocked by insta so it makes the post useless? If you get blocked how long is it for? I’ve never had any messages to say otherwise. If you have a really popular hashtag and it flies down the feed in seconds (so would therfore more than likely be ignored) does that mean all your other hashtags are the same and are ignored and pushed down their own individual category hashtag? Have you checked to see if your posts appear in the hashtag feeds? I’ve heard that if you repeat the same group of hashtags more than once daily, they won’t work. I did check on the individual hashtag feeds and they were showing but they weren’t showing for a friend when I asked them to search them. It baffles me. If since tried a complete different post with hashtags I’ve never used before and instead of posting them in the caption I’ve posted them in the comments and surprise surprise still no likes. Any ideas? 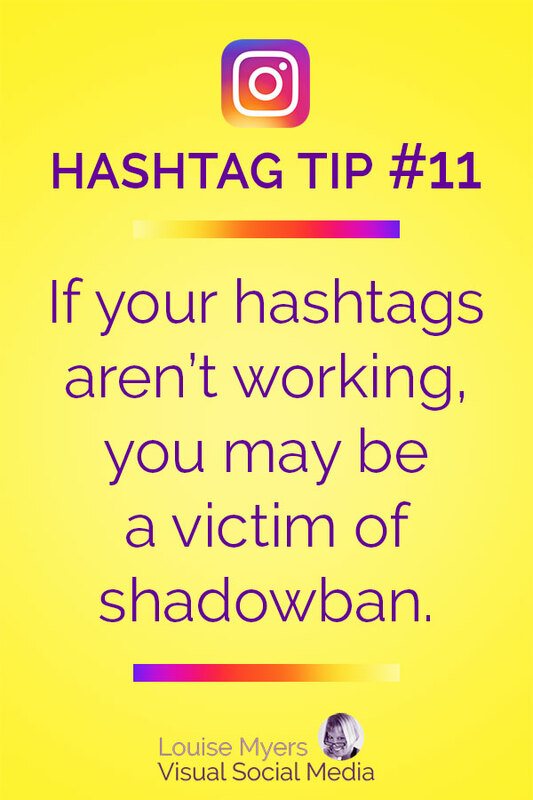 I haven’t heard of this specific problem – hashtags work sometimes but not others – but I have heard of various issues with new accounts. Perhaps Insta has new accounts sort of “on probation” and flags / blocks them for any suspicious activity. So maybe cut back to posting once a day. If you’re doing anything else like liking / tagging / following a lot of accounts, definitely stop that. Thank you for the great articles, havent managed to hide hashtags yet…! Five periods each followed by return, no space. That should work in a comment. Doesn’t work in captions though. But Instagram is hiding most comments anyway, these days. Hi Louise, great article, thanks. I’m wondering about hubs. If I am using their hashtags, should I also include their tag name (@____), or is the hashtag alone enough? If I should use the tag name, does it matter where it goes (enter it when posting photo, enter it in caption, or enter it in a comment)? Lastly, some people state in their bios that they are a “member” of certain hubs. Does that mean something different than a follower? Thank you. Each hub has their own rules about tagging them (most don’t want it but some do) and becoming a member. Usually they state this in their bio. Much appreciated Louise, thank you. I haven’t heard of this, Katie, but it seems lately that newer accounts are subject to different standards than established accounts. So do they just not work in a comment or does IG actually prevent the comment from posting? Wow. Your blog is just amazing! I can’t believe I haven’t seen this up until now! It is very insightful, relevant, legit and most of all straightforward! I just love how you reinforce your points by using both pictures and recaps in bullet form. This article is also amazing, you really did a great job justifying your points using stats. I can’t wait to try this on my next posts on IG! Wonderful, thanks for your great comment, Dee! one ig professional consultant told me that hashtags should never put in the caption but in the first comment? is that true? It doesn’t matter. They do “disappear” when in the comment, but there’s nothing “horrible” about putting some (or even all) in the caption. 4)sometimes doesn’t appear from the beginning. My account is aged more than a year. A competitor with the same set of 30 hashtag doesn’t suffer of this issue, and he post 50 daily. Other people, with new accounts, don’t suffer of this issue. Is a good option to disable my accound for 2 days? Thanks louise, you have a great blog! I’m sorry for this awful situation, Sam! Definitely frustrating. I don’t know of a way to contact Instagram. Sorry I can’t help. Have you tried sticking to only one device to access your account? I’m new to IG, nearly 4 weeks. I’m not very good at social media, and I certainly don’t understand the “ins and outs” of IG. I’ve been posting 1 picture a day, with a few hashtags in the caption area. As far as I know this is the only way to use hashtags. I don’t understand this whole system of adding hashtags to a comment. Do I make a comment on my own post by adding the hashtags in the comment? For the past week my hashtags simply stopped working. I get no likes and no comments at all–ZERO. I was getting and average of 40-50 likes per post. I did use some hashtags such as #photography without knowing it’s banned, but it did work. I was mostly using the same #s and maybe adding a few more depending of the post. I post my own photos, no selfies, nothing obnoxious nor improper. I don’t know what to do. It’s very frustrating. I’ve reported to IG on a daily basis at no avail. Any tips? Yes. The only purpose of this is to hide your hashtags and keep the post caption looking clean. It’s not necessary. I’ve heard of this a few times. You should be able to repeat the same hashtags on one post a day (more than that might make them stop working). It may be a temporary thing. Keep reporting. You may want to stop posting for a few days. You could check what other readers have done about blocked comments here. Generally, you just have to wait it out. Probably the same with the hashtag issue. I’ll wait a few days or week until I post again. Could you please list the steps for adding the hashtags in a comment without looking too cluttered? I tried this morning but it didn’t work. I typed 5 periods (…..), hashtag right after the last period without any space, hit the return key and did the same thing again for the other hashtag. 1 hashtags per line. Hi, what a great post, thank you! But, I am ready to throw my phone through the window…. 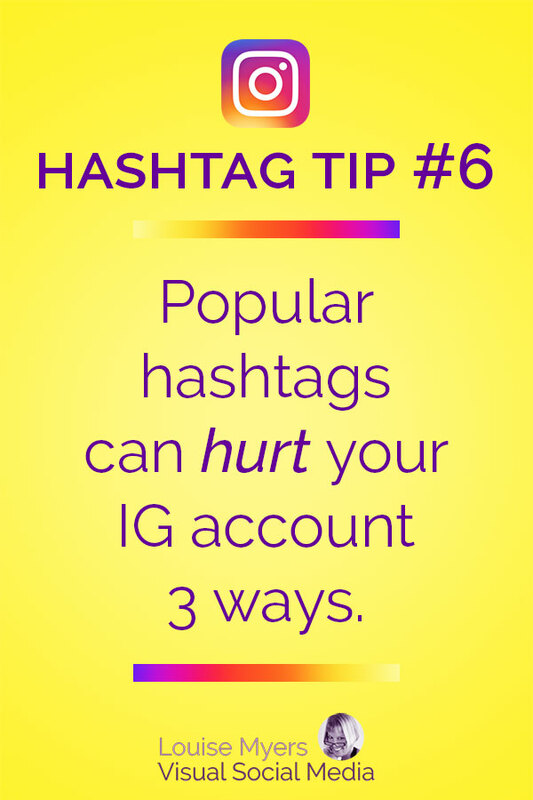 From your post: You can hide your hashtags, so they can’t look spammy! Make them invisible by preceding them with five dashes or periods, each one on a line by itself. NO space after the period or it won’t work. If you post this in your first comment, IGers will just see […] after your name in the stream. OK, I give UP… HOW DO I GET A NEW LINE (Yelling intentional) in the IG app? I CANNOT make a new line. You specifically say to place a period on each new line. Is there some magical trick to this? Sorry for lack of clarity. In a caption, you can make a return via the number keypad. But on a comment, you can’t. 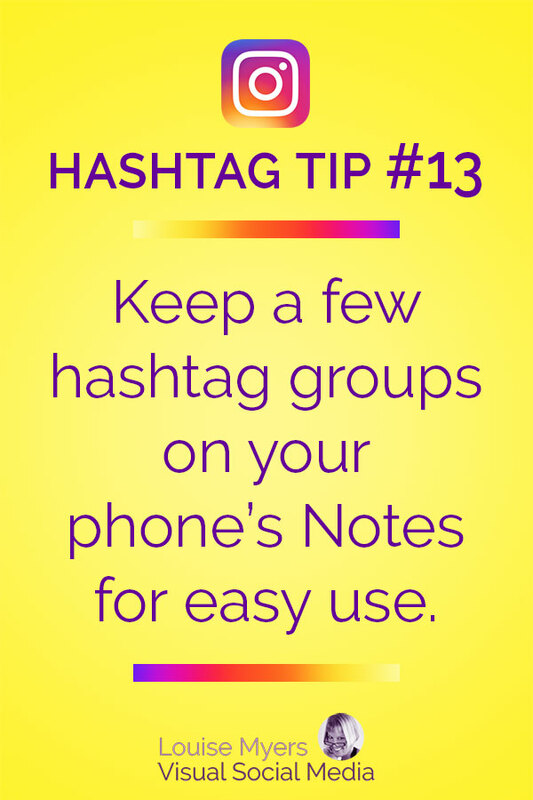 You need to set up your hashtag groups in your phone’s Notes app. but, didn’t know about the number keypad hack either. which number performs this magical trick? Still no trick – when typing a caption, the button on lower right of the number keypad says “return.” But when typing a comment, it says “post” or “send.” So you can’t create returns in comments within the IG app. But you can in a caption if you wish. The return button is visible on the number keypad when writing a caption. i think its been deactiavted? Yes, the first dot goes next to the username. If you’re not getting the hidden comment though, most likely you have a space after your punctuation. The returns won’t work in IG if there’s a space at the end of the previous line. This still works for me every day. I think this may not work anymore? I’ve tried more dots, less dots, five dots. I’ve tried posting in comments and in the descriptions and no matter what I do it still shows. I just tested it and it still works. However, the comment is only invisible in the news feed. If someone clicks to see comments, yes, they will see the hashtags. Is this where the confusion is coming in? Help! I can’t get it to post in comments. I looked for spaces already. Ok got it to work. Had too many hashtags. So do you change these up daily or by post or use the same ones and copy and paste? I use mostly the same ones every day. However if you post more than once a day, you’ll have to change them up. I’ve heard Instagram will start blocking them if you use the same set more than once daily. Hi there, I have recently been having problems with my instagram account for the past month or so where my hash tags where only my followers seem to be liking my pictures. I am not gaining he amount of “likes” comments or new followers as I normally would. This happened after I he posted a few pics in a row from a trip at the beach. Normally my content is health and fitness. Could I have been blocked is there any tricks I can do to fix it? I have also been stopped to post, comment or like anything numerous times as well ? I have contacted instagram but have heard nothing! This is so frustrating! 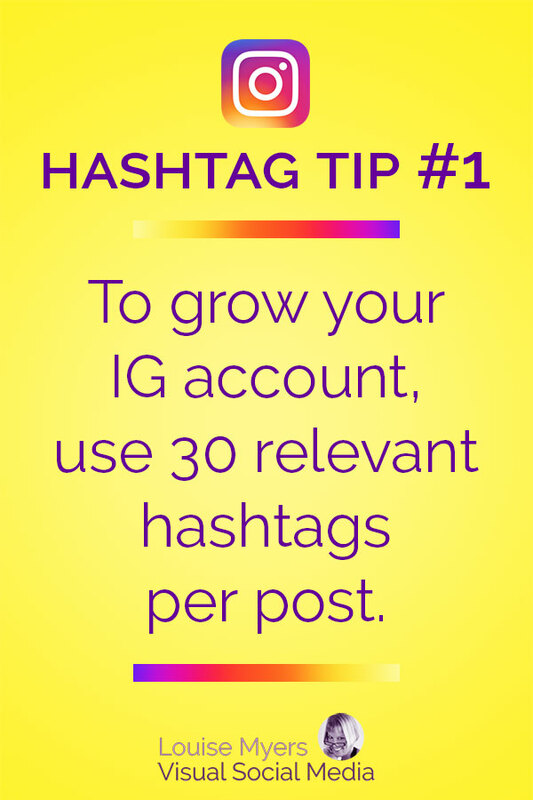 If you repeat the same hashtags more than once a day, IG sees it as a duplicate comment (which they see as spam). Hi – great information – cleared up plenty for me. 1: I’d like to set up a text shortcut with my hashtag sets with my iPhone, but the “returns” seem to get stripped even though I don’t have any spaces. It works if I paste directly from the notes – but If I paste that same string to the shortcuts spaces get added in where the returns should be. 2: You mentioned “I use mostly the same ones every day. However if you post more than once a day, you’ll have to change them up. I’ve heard Instagram will start blocking them if you use the same set more than once daily.” Does that mean I have to use an entirely different set or sail out a few within the set – so have a morning set and an evening set? Hey Milly, sorry I don’t have answers for these as I haven’t tried them. I believe you can mix up the order and change out some hashtags, but I haven’t tested it. 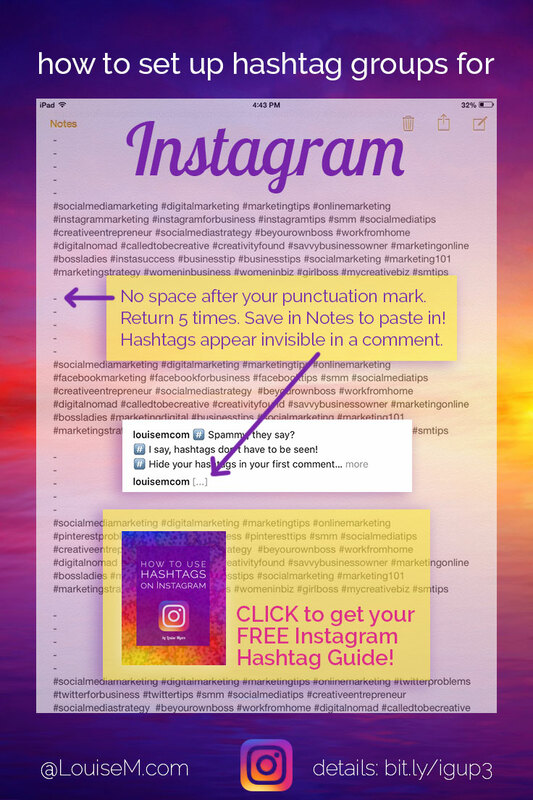 Can you clarify if the Hashtags (with 5 periods or dashes with carriage returns) are to be put in the Caption at the time of posting? Or in a comment after the posting. When I look at a post where it’s in the comment, they are not in the caption (which makes sense) but only in a “View 1 comment” which is from myself. It does not show up as the […] to click more. It shows up as a comment (and doesn’t show who) Does that still meet the intent of including a bunch of hashtags to a post? 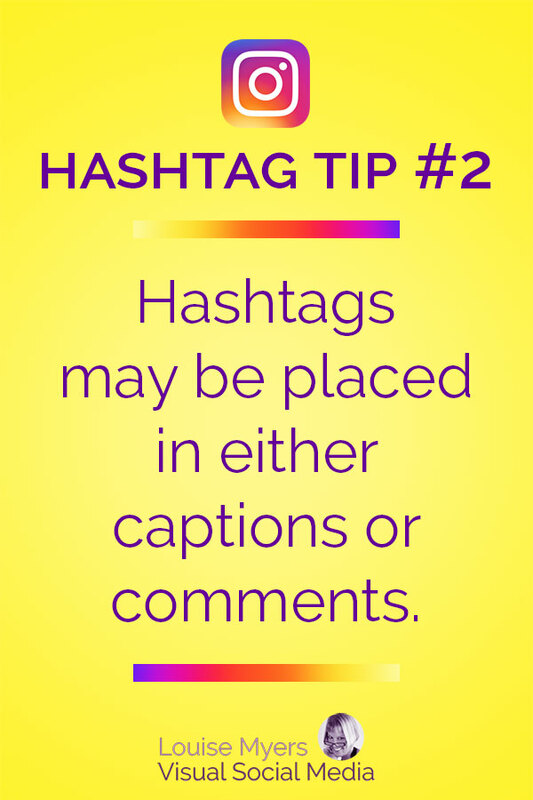 Yes, it meets the intent of including a bunch of hashtags in a post. As to why the comment is sometimes completely hidden and sometimes shown as […], I don’t know. But regardless, hashtags in a comment are more hidden than in a caption. Eventually they should be buried by other comments. Thank you so much this post has tons of great info! I was curious if there is a tool that makes it easy to see what the speed/popularity of certain hashtags is? Or do you just check their popularity number in instagram to decide on them? I use their popularity on Instagram, and how often I can rank in Top Posts for that tag. Which aren’t always exactly the same! This is amazing! I’ve learned so much between the article AND the comments. Thanks for answering everyones questions. Is this stil working for everyone else? I tried it in 3 different accounts and shows the same. That’s so odd! Are you sure you have no more than 30 in there? And it’s not a repeat of a comment you posted in the last 24 hours? That’s about all I can think of. Unless there’s a banned tag in the group! Or your connection is intermittent. What-s the point of offering a pdf that contains the exact same information as this blog post? Many people like to have it to refer to later. Close to 3K people have downloaded it! Am I using banned hashtags without knowing? If so, shouyldn’t they be telling me? 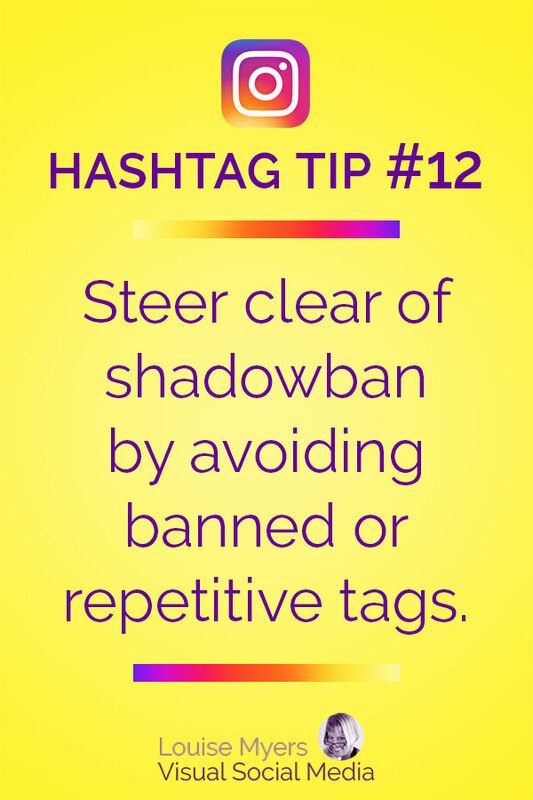 How do I know which hashtags are banned? Many thanks in advance and happy Wednesday! The last possibility is your account is currently blocked from using hashtags. This just has to be waited out. I get some random, automated likes and comments (based on hashtag targeting) after MANY weeks. But no big deal. You can delete them if you want, but it’s highly unlikely anyone will look at those posts after a couple days, anyway. Have you tried using a virtual android emulator such as ‘andyroid’ to speed things up and simplify things? Nope, I don’t see how that would help. Could you give me a template to copy paste please ?? Louise, great article! I’m new to getting my business up and running and I am now the concept of using hashtags. 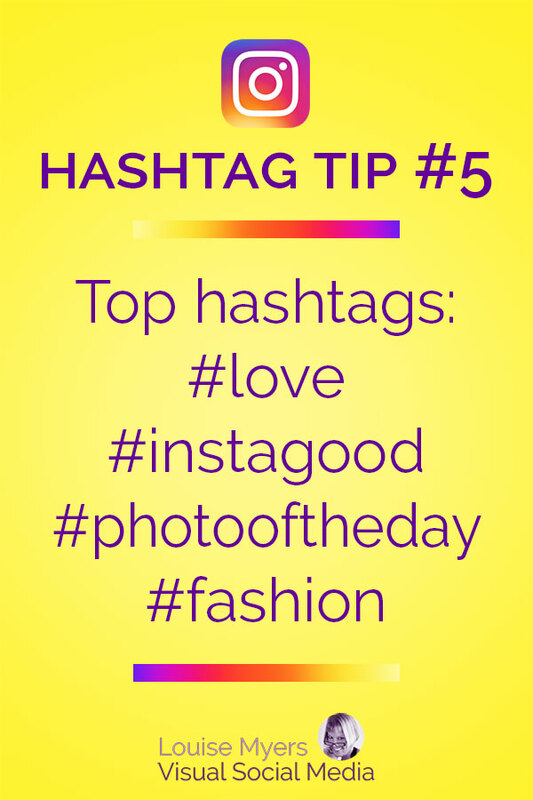 Do you recommend using the hashtags in the caption, comments, or both? I personally, feel it would look cluttery and over done if I was to see tons of hashtags in a caption. I prefer seeing them in the comments because quite frankly, I don’t really have to see them. However coming from the business standpoint, I want to do what is going to be the most fruitful for me. I know I’m late to this thread but hopefully you could give me some insight! 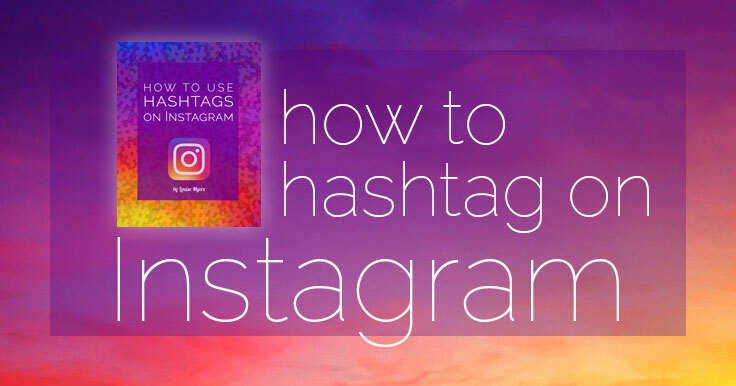 Use the right and relevant hashtag for your photos in Instagram. 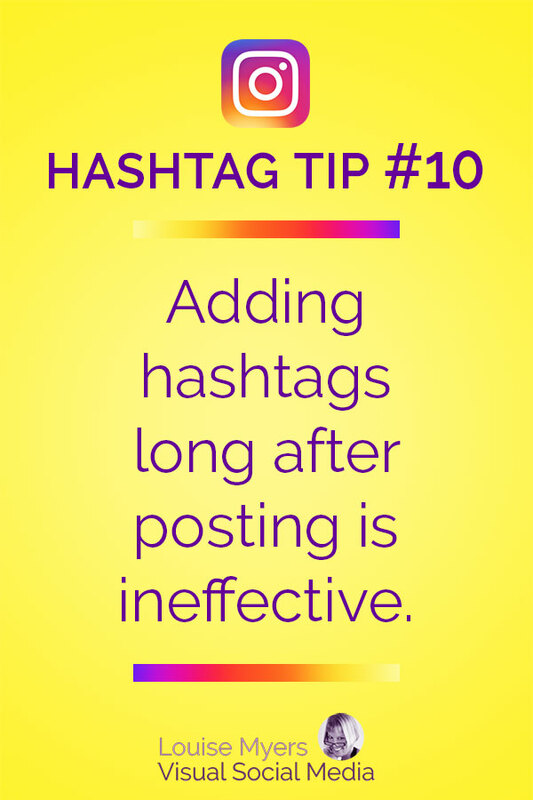 But don’t use too much hashtag, 4-10 is fine for each post. If I add 5 periods in comment it hides that comment in photo list, but then I can only use 25 hashtags. Is that for all or am I doing something wrong? I’ve never had this happen. No idea why. 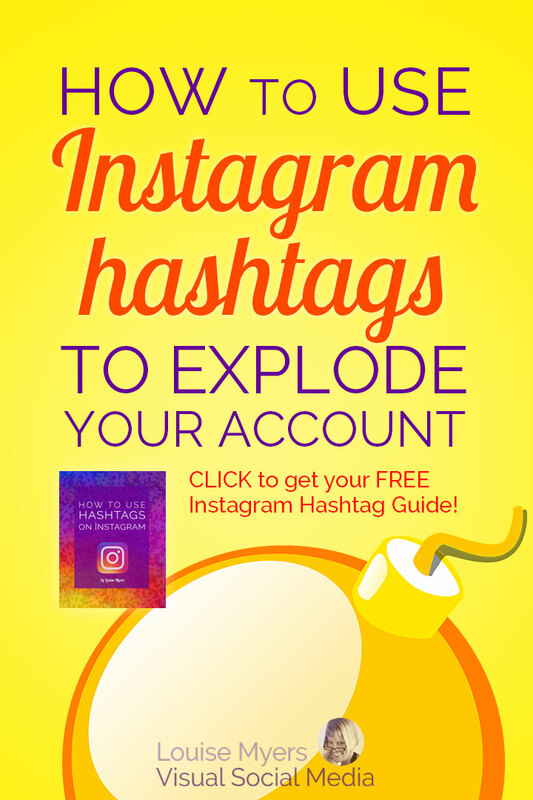 Thank you for this instructional blog on instragram hashtags. I am sure this question has likely been addressed, however I have trawled through and not come across it. I understand that the reach of an instagram post is significantly expanded proportionate to the number of hashtags that one uses. I have noticed some accounts that put the majority of their hashtags as their ‘first comment’ rather then in the actual post itself. Does this still get the same reach? Social media managing accounts such as grum.com offer a feature whereby you can input your ‘post’ and your ‘first comment.’ I am just trying to understand better and would appreciate your expertise. As far as I know, and since many pros use this tactic, I do believe hashtags get the same reach whether in a comment or caption. Hi Louise Myers, Many many thanks for this amazing, helpful, informative article! If someone can implement your post , then must be getting more traffic/followers in their business. There are many issues to gel maximum followers, in your post you outlined almost all of them. So i think this is an ideal post for Instagram. The information that you have provided above gave a lot more clarity how the hashtags really work and I am thankful for that. But I am facing some issues from last few days that my posts are not appearing in the hashtags feed, sometimes they appear for few minutes and again disappear. I am not getting the engagement and likes as earlier, I tried using different hashtags and also not using Instagram for few days, but the problem still persists. please help me as this is discouraging me not to use Instagram. There are so many possible reasons for this! I’ve been through it myself in the form of a shadow ban.You may want to research further to see if you can pinpoint your problem. Yes, exactly. It’s a very popular trick among Instagrammers, but it’s certainly not necessary. Hi Louise, this is an excellent read, thanks so much for posting. Have you found a way to include the . [return] x5 in a text shortcut on an iPhone? Many thanks! Yep! Use the Notes app. Hide your hashtags in a comment with . and return, 5 times… 😀 Thats one of the secrets to a clean looking post Louise ;). It’s such a mess looking at a post with 20+ hashtags in caption. Distributing them in set of 7-9 (caption) and rest in comments…separated by dots is a great growth hack tip for Instagram. I doubt it’s a growth hack, but it does look better. but I posted 1 pic with hashtags and in response, I get many engagements on my pics and get likes too. So now am believer in the power of the #HASHTAGS. Now I need to ask, if I use the hashtags on the someone’s comment then I also get the engagement that I get in the pic? If I understand your question – You can’t add someone else’s photo to a hashtag feed, only your own. Hi. Seems that I’m shadowbanned on IG but not sure about the reason because I’ve been very careful. I don’t mind posting without using hashtags for a week or so but the main problem is that when I unfollow this account from my personal one and check my custom tag I can’t scroll down as if it was blocked. But I think it’s important to use it if I want it to be my branded hashtag. Do you know if IG will unblock my custom tag after few days? Thanks for all the information ? I think if your tag was blocked you’d see a message from IG on the tag feed. Is it too late to go and put them now? Should I delete them and post them again with hashtags? I wouldn’t delete them. Just use hashtags going forward. I read your great article and all of the comments. I knew many of the details already, but ran into a hashtag problem this morning on Instagram. I started an account years ago, but left it private for many years and didn’t use it much. More recently, I opened my account to the public and started to post my professional level photography on my feed. In order to gain new followers, I used 30 hashtags for each of my photos. I would post about once a day or once every other day. Most of my hashtags I used were active hubs where some of my photos could be featured. In 4 months I gained about 900 new followers. It was fun and exciting to see new people into my photography work. I typically post a landscape shot, then wildlife, then nature, and maybe some throwback work, so as to not repeat content or hashtags on a frequent basis. This morning I posted a photo of a close-up Bobcat profile photo. Immediately I noticed that the initial “likes” weren’t coming in at the typical regularity. Usually when you tag accurately, the first 1-20 minutes nets a lot of Non-follower activity (likes, new followers etc.) That is the point of hashtags. My Bobcat photo did not. Instead I noticed that every like came from a follower of mine. Then one of my friends commented and said “check your hashtags, they don’t work, tried them twice”. So I checked myself, and sure enough my photo of the bobcat was not in any of the 30 hashtags I used. I decided to log out of my account and log back in. Then I waited a few hours and made a new post of Milky Way over Half Dome. I did 30 new hashtags for it. I posted it and checked in on the shot 3 minutes later. No “non follower” likes, and my photo was not in any of the hashtag “most recent” feeds I chose. Will this reset somehow on its own if I stay inactive for a duration of time? How can this be avoided going forward, if it does reset? For a photographer like myself, getting my work in front of new followers is one of my goals, and there is no other way to really do this besides using hashtags. This is a continuing problem. It’s so frustrating! Instagram says it’s just a glitch, but IGers call it “shadowban.” Google it. Good luck! From what I read about shadowban, it says only accounts not following you cannot see your posts in the hashtags you use. This is not what happened to me. I can’t see my pictures in my hashtags. My followers can’t either. No one can. Is this a different type of shadowban than what I read about? There’s really no way to know, because “shadowban” isn’t recognized or defined by IG. But the same fixes should help. 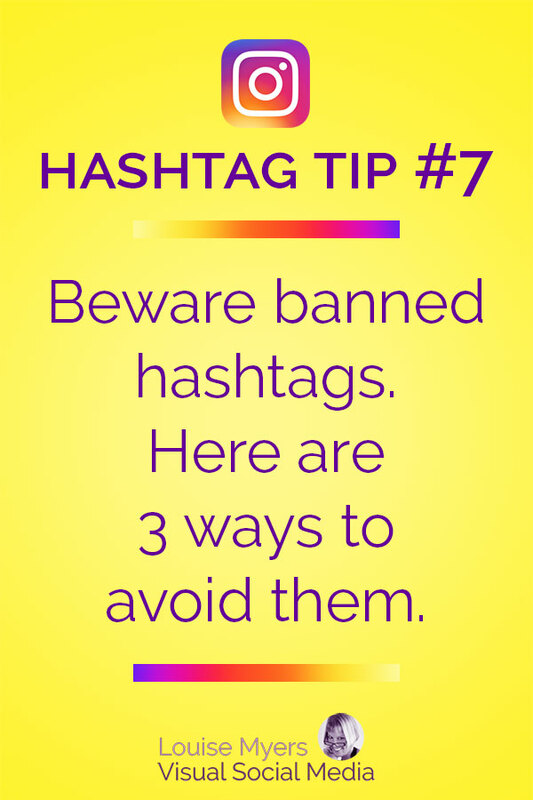 Most important, make sure none of your hashtags are banned. Hi John, how did you fixed it? I have the same trouble right now. My posts are disapearing from feeds 🙁 do you have any advice? Google “shadowban” and you should find some suggestions. Good luck! Very useful article thanks. I was trying to aim for 30 most popular hashtags, but his article makes so much sense. Hi Louise, this post was very informative! The initial reason I opened it though was in case you knew how many posts start a hashtag. Meaning, if a hashtag doesn’t exist and I want to start it, how many posts does it take for them to start appearing under that hashtag name. Any ideas? I’ve looked elsewhere too but couldn’t find anything and you seem to be on the know so I thought I’d ask! Thank you! ? I’ve clicked on hashtags that have 1 post showing under them. So I’d guess it’s fairly immediate. 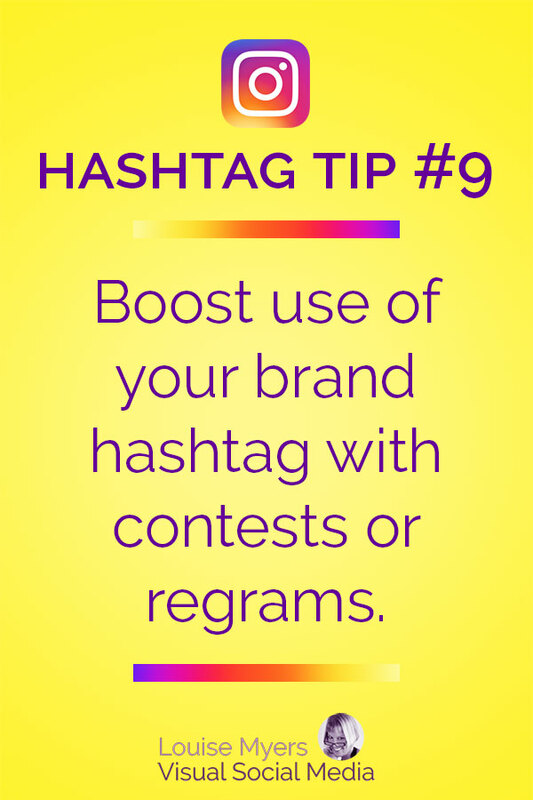 Are you creating a brand hashtag? 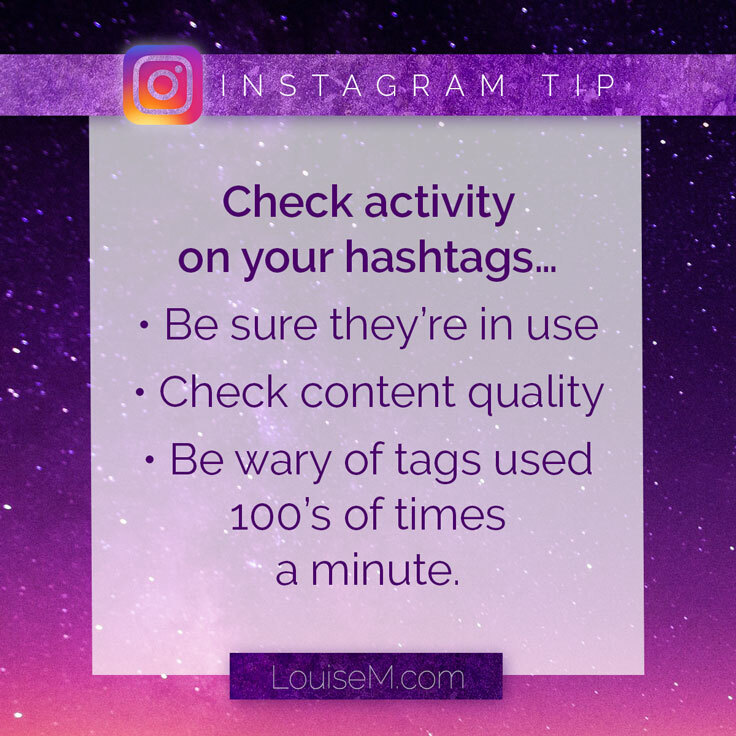 This is really useful – I feel like I’m always still learning more about how to optimize Instagram so these tips are helpful! Is it worth adding hashtags to old posts? I used to post pictures with zero hashtags. Unlikely old posts would surface in hashtag feeds, unless they were extremely popular.